Hanson is a former Vietnam Vet and Portland, Oregon cop, now patrolling the racially diverse and mean streets of Oakland, California in the 1980s. His former time in Oregon apparently counts for nothing as he’s treated like a ‘wet behind the ears’ rookie by many of his police colleagues - but nothing is further from the truth. He’s world weary, unorthodox, offering resolution rather than confrontation in his interactions, though like many of his fellow police officers - this is unusual, but also understandable. He’s keeping his head down, trying to stay invisible and at the same time tick the boxes that will get him through his probation, washed down with a few slugs of tequila along the way. He sees racism, but doesn’t see race himself. Treating everyone the same way he strikes up a friendship with a local black teenager, Weegee, as well as a kind of respectful acquaintance with the local drug kingpin, Felix Maxwell. He antagonises his fellow officers by refusing to corroborate their ‘agent provocateur’ arrest as being lawful, but instead clings to his own code of what’s right and what’s wrong. 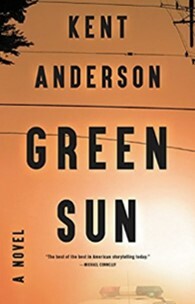 Green Sun emerges as a mournful paean to a policeman trapped in a system that’s neither fair to the cops, or the people they’re policing. A wall in the Police Station (with the names of officers killed in the line of duty), bears witness to the dangers they face on a day-to-day basis and yet there is never any backup available in these budget-constrained times. Hanson survives by making just enough arrests and citations to keep his head below the parapet, whilst not compromising his own beliefs. Inevitably, Hanson is faced with a number of choices in rapid succession. It’s how he deals with these choices and the person you’ve seen grow through the book, that makes those decisions stark, yet true to the man you’ve come to know. A compelling read, and Mulholland must be applauded for returning Kent Anderson to our bookshelves.